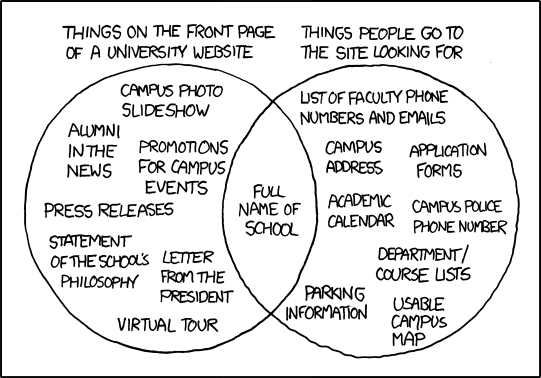 University websites have a reputation… I’m sure we’ve all seen the infamous XKCD comic. The good news is, there has been a movement in the last few years. Universities are taking the time to create well designed interfaces. There’s a movement to look at metrics and remove those features that aren’t performing. Erik Runyon’s work at Notre Dame has shown us that our carousels aren’t working. We’re starting to take the time to carefully consider good information architecture. 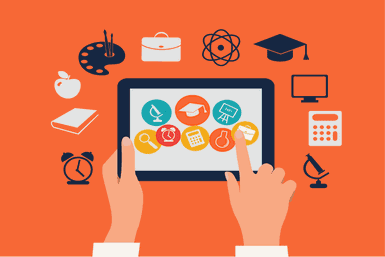 We’re making progress and we’re seeing results; universities are now spending time and energy designing a feature rich, mobile first website that is user focused. We’re doing so much better than we were just a few short years ago. Last week I attended Industry Conference in Newcastle. Talks ranged from everything from “Advanced image compression techniques” to “Designing for social change” and everything in between. One talk that rang true to home was Sara Wachter-Boettcher's talk which she titled “Content amid chaos”. We’re making great strides in university web design. But at the end of the day, content is the most important piece of the puzzle. And we still have work to do there. We’ve all known for a long time that “content is king” but it feels like at some point this message was misinterpreted to be “lots of content is king”. The reality is, it is great content that is important. Too much content, and unnecessary content, can do more harm than good. It’s easy to understand how this happened. University websites are around a lot longer than most websites on the internet these days. That means there is content on many sites that goes back decades! It’s not just web pages either. I know it’s not unusual to have a mountain of a few thousand PDFs that “can’t be removed”. So nobody blames you, we know how we got to this place. It makes sense. The interesting point here is that most people know this about their content already in universities. They know there’s probably more content than needed, or that the content could be better written. But where do you start? The sheer amount on content is staggering. Sometimes tens of thousands of pages staring back at you all needing some work. It makes sense to me why people are more likely to whistle and walk the other way than they are to try tackle the problem head on. And who can blame them? I wouldn’t like to take on that mountain of work. I don’t have the time; I already have a full time job as it is. I’d need a team of people working full time to overhaul all that content. It is zero help for someone to run a report on your site and give you the feedback you already know. “Your content needs work”. What’s needed is simple practical advice about how to make this situation better. What I liked most about Sara’s talk was this is exactly what she gave us. Sara’s talk very eloquently showed us the commonalities between the litter epidemic in her home town of Philadelphia and the chaos of the web. Everybody in Philly knew that there was a litter problem but it wasn’t getting better. The problem was just too big to tackle effectively. But then something magic happened (OK, maybe mot magic but – interesting). A small group of people took it upon themselves to overhaul the block in which they lived. Not their neighborhood, not the whole of Philly, but one. Single. Block. They organized for people to clean out empty lots. They organized for people to create a public garden. They planned out and achieved something that was next to impossible for Philly to achieve as a whole. Their block looks great. The idea is simple but it’s effective. Accept that you can’t remove all 800 of those PDFs from that site. But what you could do is take the 30 course catalogue PDFs and get them into HTML. Accept that you can’t remove the superfluous content in every section of your site. But what you could do, is work with the Mathematics department and let them see how much more effective good, concise content can be. (You can show them analytics, those math people love stats). Accept that you can’t fix all the content on the site yourself in a day. But you could fix a little bit yourself in a day. And you should.